“Gadgets have become popular even among those who had little interaction with computers and are less familiar with computer security," Darya Gudkova, head of the content analysis and research department for Kasperky Lab, said in an email. 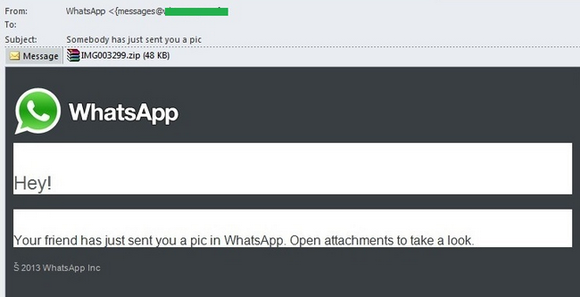 "This opens up new vectors of attacks for spammers and phishers. In other words, the same rules apply. Just because the message is within WhatsApp or appears to come from some other mobile app you use doesn’t mean it is legitimate. You have to exercise the same caution and common sense to recognize whether a message seems legitimate or not and have the self-discipline not to open unknown attachments or click on suspicious links no matter who or what they seem to have come from. The Kaspersky 2014 Q1 Spam Report also notes that more than 70 percent of the spam messages weigh in at less than 2Kb in size, and more than 90 percent are 5Kb or less. I guess if you’re sending out millions of spam messages, you want them to go fast, and you don’t want to exceed the bandwidth allocation for your ISP. More importantly—since most spam is distributed from compromised PCs—you don’t want to raise red flags with the victim’s ISP.